Asfaw just joined NAAHP’s HR Team as Volunteer HR Manager as of May 17, 2017. Asfaw has nearly 20 years professional HR and Administrative experience in variety of industries including retail business, not for profit organization and professional services. 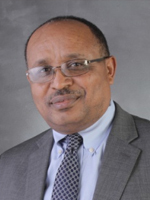 Prior to joining the HR Team, Asfaw’s work history includes being HR Consultant and HR Director for the International Training and Education Center for Health/ I-TECH’s largest country program in Ethiopia, HR and Administrative Manager, at the National Motors Corporation in Ethiopia and recently as Senior Paralegal and Office Manager with the Law Office of Alan Gudeta in Silver Spring, Maryland. Asfaw supported fast growth companies by linking people strategies to business strategies. His expertise includes talent management, organizational development, training and development, and management coaching. His strategies realized consistent results in decreased days to hire and decreased turnover rates. Asfaw earned his Bachelor and Master of Arts degrees in International Relations from Addis Ababa University; and an MBA-IB from Lincoln University. He is a Senior Certified Professional (SHRM-SCP) and a member of Society for Human Resource Management.